Great-looking paste with a semi-sheen finish that makes hair look effortlessly cool. 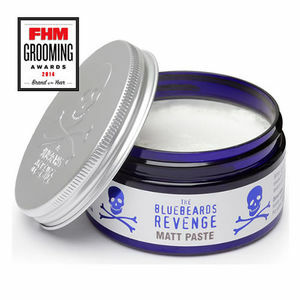 The Bluebeards Revenge Matt Paste offers a light to medium hold that holds unkempt hair in place without making it look slimy or greasy. Hair will sport a touchable texture that has a semi-sheen to it, looking like your client hasn't had to try too hard to achieve a superb look. Gentle exfoliating facial scrub made from crushed, natural olive stones and ginger, suspended in a rich cream that cleanses and moisturises. Definition and manageability with flexible control from a medium to strong hold that looks natural and lasts all day. A slick pomade with a high-shine finish and an industrial-strength hold that can tame even the most unkempt hair. An ultimate quiff-grooming tool to achieve height and texture for your clients' hair. Best used in conjunction with products like The Bluebeards Revenge's own Matt Clay to provide the hold and definition your clients demand.